This is a special limited edition created using a continuous tone printing process. Each canvas Antilier National edition is hand highlighted and is designated with the letters A/N following the print number. The finished product is very textured and it has more the appearance of a Renaissance edition. 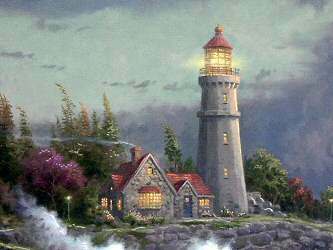 Only very few Kinkade images ~~ less than 3% are ever made in AN edition. It is considered a *SPECIAL* and very few are made in the quanitity. 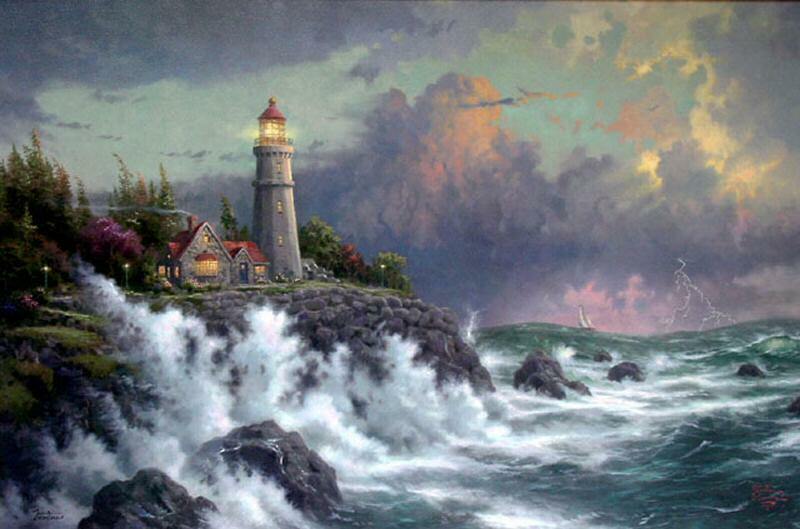 Conquering The Storms is Thomas Kinkade's sixth lighthouse painting in his very popular Seaside Memories Series. There are currently a total of 8 paintings this collection. ++++ RARE! This Atelier National edition is limited to only 400 in the world! ++++ Hand Embellished Oil Highlighting This canvas is luminous and the artwork shines like the lights are shining in the lighthouse acting as a beacon. Notice the flash of lightning which also shines in detail #2, click it to see magnified image! Additional highlighting certificate and also photos of the highlighter doing the highlights on this artwork are included! 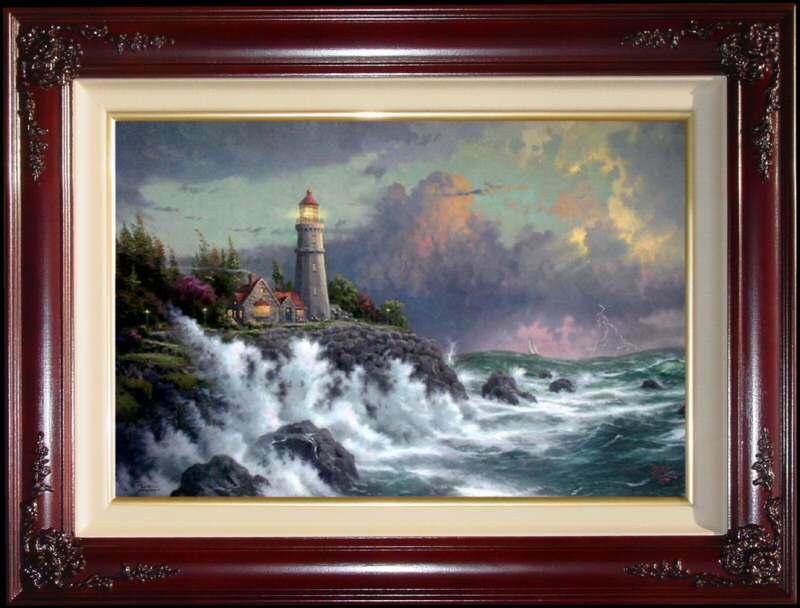 ++++ Brass Plaque with the legend "Conquering The Storms ~~ Thomas Kinkade"
Atelier National (A/N) The Atelier National edition is a special limited edition created using a continuous tone printing process. Each canvas Artlier National edition is hand-highlighted and designated with the letters A/N following the print number. 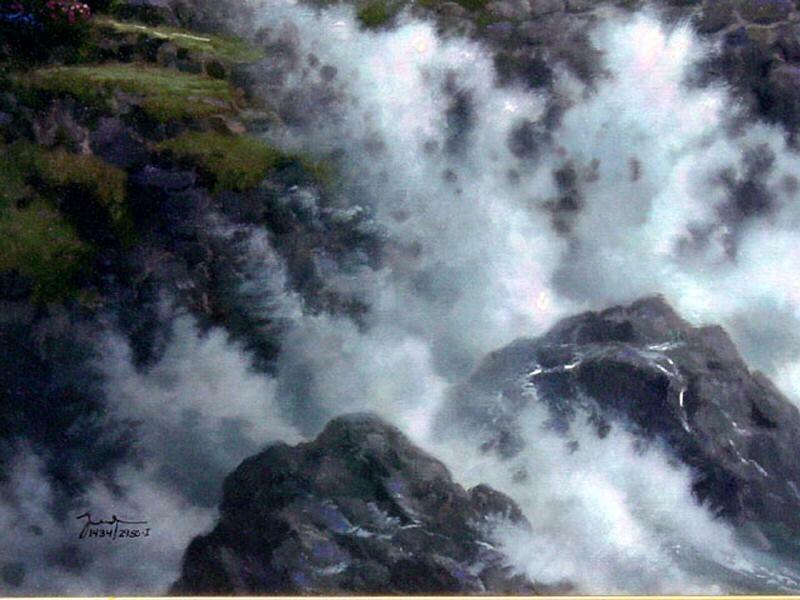 It gives a more giclee look of "wet oil" freshly painted and the highlighting is very visible. "Inspiration waits around countless surprising corners. Sometimes I even find it on an inspirational CD! Not long ago, a friend shared spiritual music with me. In the CD cover photos of brilliant lightning flashed. Moved by the music, I considered the power of lightning. Once it frightened me. Then I was a child, and the fire that ripped the sky was a fearsome mystery. Now I understand lightning to be the power of God made visible, and I take comfort in it. 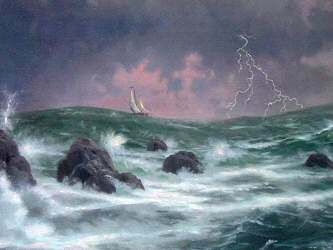 In Conquering the Storms, sixth in my Seaside Memories collection, I confront images of God's awesome power - lightning, storm clouds, driving winds, pounding surf. Here in truth, is a storm that can shake us to the core of our being. And yet, if we hold onto the rock of our faith, we can ride out any storm. The massive octagonal lighthouse is an image of that rock; its light guides the sailboat, riding fearsome waves to a safe haven. "Conquering the Storms" is a parable in paint, an inspired affirmation of the great gift of faith, which allows us to accept the power of God as a source of strength."